Super Sized Climber Pads. Measuring an extra large 9" x 12", these climber pads evenly distribute pressure over your calf for added comfort. 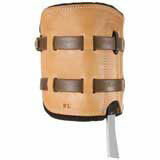 Pads are constructed of durable, weather-resistant top grain steer hide harness leather lined with 1/2" black felt. Requires 2prs - #2639 - 1" x 26" Nylon straps.